1. 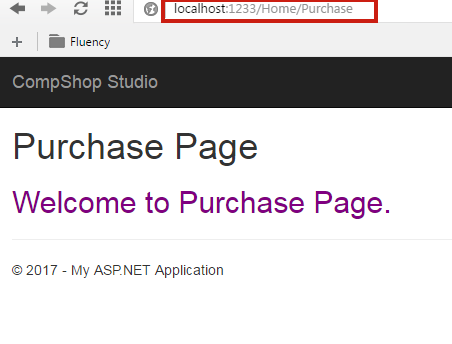 How to Add a View Pages in ASP.NET MVC 5? 2. How to Add a View Pages from Controller’s Action Method? 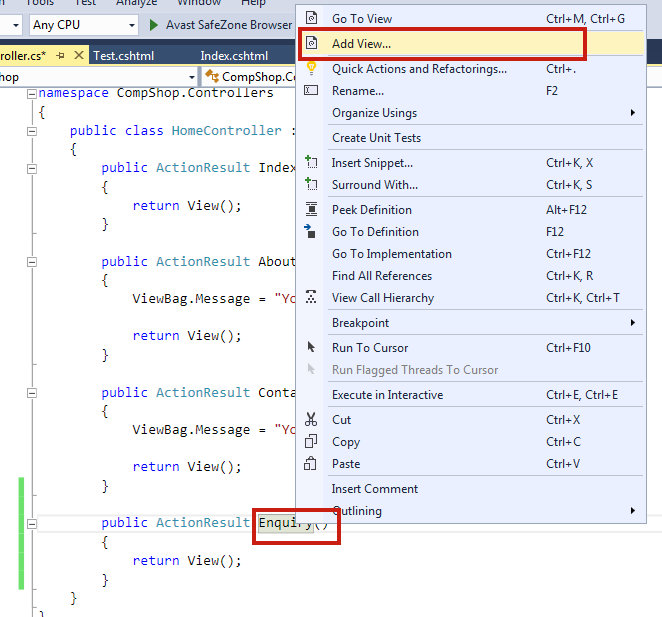 There are 2 most popular methods to adding a View Pages in ASP.NET MVC 5. Or, Add a View Page from Controller. Before Adding or Creating a View Page, you must understand following rules and guidelines of adding a view page. 1. View Pages must refer to a controller action method. If you have added a view page but didn’t create an action method in the controller, then you will get HTTP 404 Error. This is because, in MVC, Controller manages user request and returns a response to the user. So, if the action method isn’t available in a controller, the controller will return HTTP 404 Error message. Let's understand it with a real example. b. The request goes to Home Controller first and finds Enquiry Action Method. c. If Enquiry Action method found in Home Controller then it will look for Enquiry.cshtml View Pages in Home Folder. d. You must remember that every Controller should have a folder in Views with the same name as controller name. 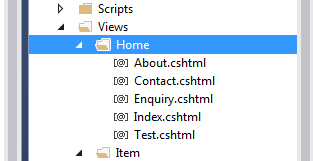 And, every folder in View should have .cshtml view pages as the same name as an action method. e. If there is Enquiry Action Method in Home Controller, there must be Enquiry.cshtml View Page in Home Folder in Views. 2. Controller name and Views Folder name should be same. 3. Action Method and .cshtml file name should be same. In this example, I am going to add an Enquiry Action Method in Home Controller and then I will show you how you can create a View Pages for Enquiry Action Method. 1. Open HomeController.cs and add following code. 2. 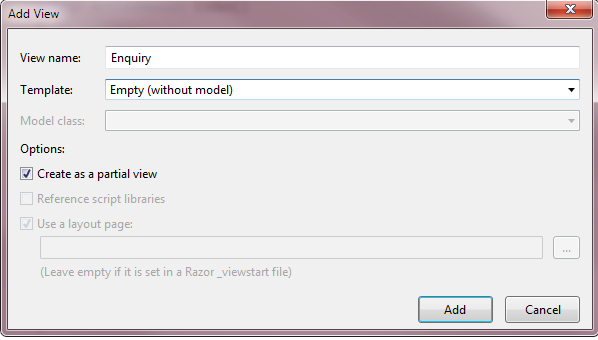 Now, right click on Enquiry() Action Method and choose Add View. 3. Add View Dialog box will Open. Don't change View name and it should be named as Enquiry. Select Empty (without model) in Template combo box and click Add. 4. 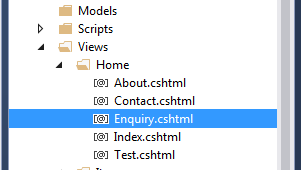 You will see that an Enquiry.cshtml is added in Home View Folder. 5. Open Enquiry.cshtml page and write following code in it. 6. Run your project and go to the following link. You will get HTTP: 404 Error. Let's understand it with an example. 1. 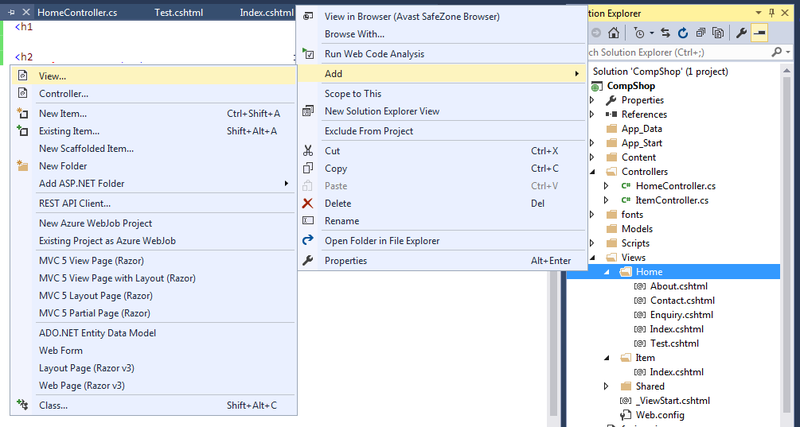 Go to Solution Explorer Views Home. 2. Right Click on Home Folder Add View. 3. Give View Name: Purchase and click Add. 4. Open Purchase.cshtml and add following code in it. 6. You will get HTTP 404 Error. Why? 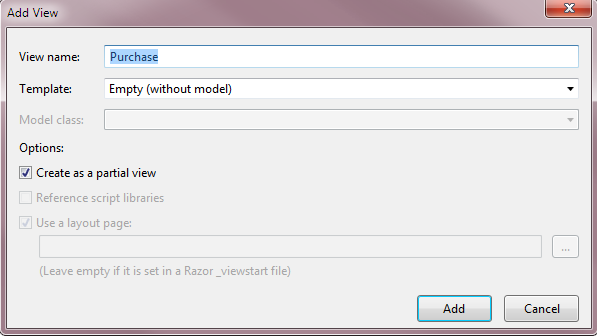 Because you haven't created an Action Method which renders these Purchase.cshtml to the client browser. 7. Go to Controllers HomeController.cs and add following code in it. 8. Now, run your project, you will see the Purchase Page instead of 404 Error page. 1. How to create Master Page Layout that gives consistent look to your site. 2. How to apply custom CSS/HTML template to design your site. 3. There are lots of free CSS/HTML themes are available for free download and you want to apply these themes to your ASP.NET MVC5 websites. Don't worry, in the next some chapter, you will learn how to design Master Page Layout in ASP.NET MVC5.